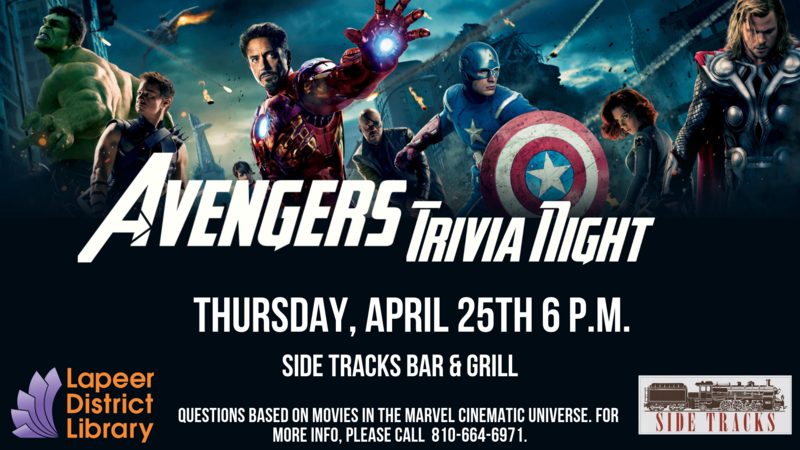 Join us for Avengers Trivia Night on Thursday, April 25th at 6 p.m. at Side Tracks Bar & Grill. Teams will answer trivia questions based on the movies in the Marvel-cinematic universe. Bring a group of friends or come alone and join another team. The winning team will get a prize basket valued at $50, donated by the Friends of the Marguerite deAngeli Branch Library. LDL hosts themed trivia nights each month at Side Tracks Bar & Grill. Watch our Facebook page to find out what next month’s theme is!